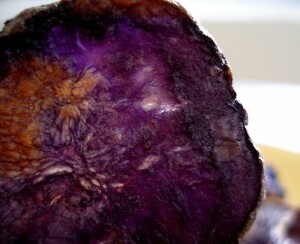 Ever since last Wednesday and my visit to the open-air market on avenue Président-Wilson I’ve had purple on my mind. 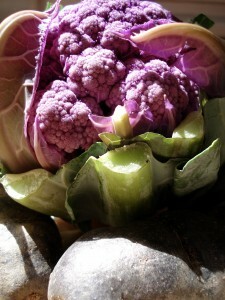 What did I do with the three-inch-wide mini purple cauliflower and the purple potatoes I picked up? Cauliflower, I have to be honest, is the only vegetable I really don’t like. I’ve recently given it several tries (boiling it in water, using it in a gratin)- I just can’t make myself like it. It smells funny when its cooking, it comes out mushy and it doesn’t seem to have much taste- so imaginative. When I saw the little purple cauliflower, I said, “Okay, at least it’s original (and really cute). I’ll give it one more try.” So, I set out to make some “likable” cauliflower. Instead of doing what I usually do and boiling it in a pot of water, I decided to do what I do with my favorite veggies: I chopped it up, tossed in some red onion (purple, in my opinion), drizzled it with a bit of olive oil and sprinkled it with my new herbed sea salt. Then, I roasted it in the oven until it was brown and crispy. Simple, and I actually liked it. 2. Wash and thinly slice the potatoes (as recommended by the vendor at the market, leave on the skins). 3. Pat sliced potatoes with a paper towel to remove excess moisture. 4. Lightly coat baking sheet(s) with olive oil. 5. Lay out sliced potatoes (on layer high) and lightly brush with olive oil. 6. Sprinkle with salt and chili pepper flakes (add more to taste if needed after cooking). 7. Bake for about 20 minutes (place under broiler for the last few if they’re not crispy enough). As you’re munching, ponder this. Purple veggies are purple because they contain anthocyanins. These are water-soluble (purple, blue or red) pigments found in plants. Anthocyanins are really interesting (and busy) little molecules. They help protect plants against UV-rays, attract bees to flowers, and are thought to be beneficial to humans, thanks to their antioxidant properties. Blueberries, eggplant, radish… if it’s “purple,” it’s supposed to help fight disease by preventing harmful oxidation (get it, anti + oxidant) in our bodies’ cells. If you’re not in the mood for red wine (grapes, of course, are full of anthocyanins), have some purple veggies.